Meet the Sami family and their reindeers in Sorrisniva, Norway. A wonderful experience for the whole family! 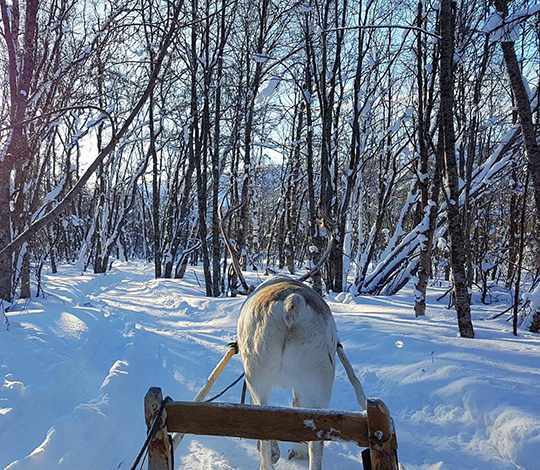 A perfect adventure combining reindeer sledding and Sami culture experiences. This is a unique and intriguing experience amid breathtaking scenery at Sorrisniva in the Alta valley. The Sami guides will guide you along through unforgettable events that highlight their past and present culture. 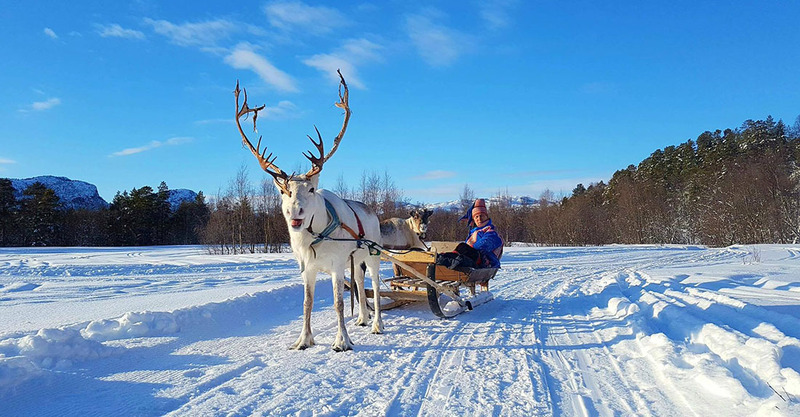 You will meet reindeer, drive your own reindeer sled, and hear stories of the old days and the special singing that is a cornerstone of Sami culture. During the sled ride, you will warm up by the fire in a traditional Sami tent, or “lavvo”, and enjoy hot drinks and a snack. The Sami guide meets you in the reception at Sorrisniva at 11 am. Spare time to relax or visit the Igloo Hotel and lunch before the transfer goes back. Lunch and entrance to the Igloo Hotel is not included in the price. Transfer, coffee and a snack, thermo suit, winter boots, warm hat and gloves. An exciting and quiet nature experience in the arctic winter darkness. An exciting and quiet nature experience in the evening. Meet the Sami guide and his reindeers. Sitting in a reindeer sled they will take you out looking for the Northern Lights. 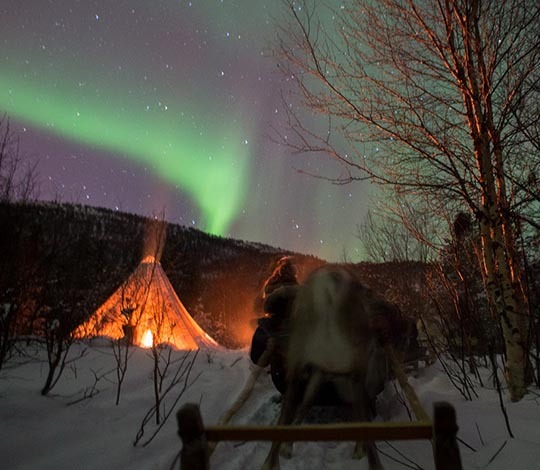 Along the way, they will tell you stories from the Sami culture and legends about the Northern Lights and perform joik. During the trip, you will also visit a lavvo (Sami tent) where you will be served coffee and a snack around the fire. The Sami guide meets you in the reception at Sorrisniva at 20.00 pm. Perfect adventure for groups looking for a different adventure. Dinner or lunch and visit to the Igloo Hotel can be combined with this activity. A Sami Experience where two people share one sled while the reindeer lead you along a pre-made track. 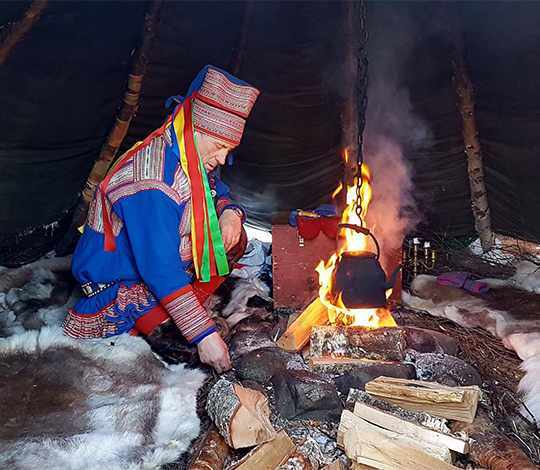 Hot drinks are served in a traditional Sami Lavvo while your Sami guides tell you about the Sami way of life and their culture. There might also be a chance to experience the traditional Sami Joik. A song dedicated to family, nature or other things close to heart. Maximum 24-26 people per group. With groups over 12 people the group will be split in two. The trip can be organized after the group's wishes. Transport, dinner, lunch and accommodation at the Igloo Hotel can be combined. Warm drinks and a snack, thermo suit, winter boots, warm hat and gloves. Can be organized on request. Must be pre-booked.